BMW Sauber has now announced that it will be retaining the services of both Robert Kubica and Nick Heidfeld for 2009. This is an eminently sensible decision, typical of the level heads that guide the team, and it ensures that BMW will start the new season with a proven driving team of considerable strength. The retention of Kubica is no great surprise, Robert having proved one of the best of the new drivers, but some might raise an eyebrow at Heidfeld staying with the team. Nick has had a difficult season, struggling at first with the handling characteristics of the F1.08, and it is only recently that he has emerged again as a reliable and consistent performer. The fact that Dr Mario Theissen had the patience to work with Nick until he overcame his problems demonstrates the common sense and practicality of the BMW team manager, something not quite so apparent in other teams on the grid. If Fernando Alonso had been available, the story might have been different. BMW admitted earlier in the year that they were talking to the double world champion but it seems that he has opted not to take up any offer that they might have made. It is no secret that Fernando wants to go to Ferrari eventually and would have been unwilling to sign for longer than a year, therefore - this was most likely the sticking point. Personally, I feel that the outcome is best for the team, the combination of Alonso and Kubica being potentially explosive and self-defeating, as seen when the Spaniard was with McLaren. Robert Kubica has given some signs of dissatisfaction with the development of the F1.08 through the year, as pointed out by Dan Brunell in his article for F1-Pitlane. Unlike Dan, I think the team have continued to work on the car and Robert's statements have more to do with the direction of development than any lack on that score. We know, for instance, that Kubica was unhappy with the amount of time spent by the team in getting Heidfeld and the car to be more effective - no doubt this slowed the pace of change favoring the Pole's driving style. But that is the way of teams that do not choose an overt number one driver; if the driver's styles differ as much as do Kubica's and Heidfeld's, development must always be a compromise between the two. It is wrong as well to think that BMW have fallen behind. 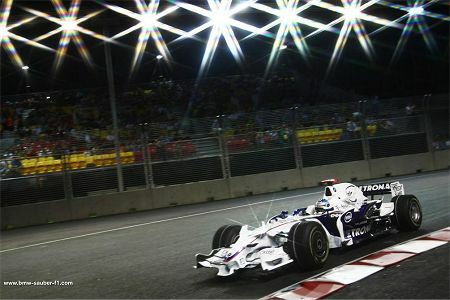 In Singapore, Robert qualified in fourth spot and Nick in sixth. That was proof enough that they are still up there with McLaren on tight circuits and it was only a ludicrous penalty for Nick from the stewards and bad luck in Kubica's race that pushed them further down the leader board. Had the team given up on the car as suggested by Dan, there is no way that they would still be in with a reasonable chance of the constructors championship, as they are. And it is the constructors award that now drives the BMW effort - by mid-season it was clear that Kubica would not be WDC without some form of miracle intervening. The strength of the team has been in their consistency and finishing record, however, and it is this that keeps them in the hunt for the team trophy. Robert may not like it but reality says BMW must keep both drivers competitive. The team is only twenty points behind the leader, McLaren, at the moment. That is the result of BMW having both their drivers in the points more often and the big two having only one or neither of their drivers scoring in too many races. If we look at the standings, we can see that BMW have scored in every round, whereas both Ferrari and McLaren have failed to put points on the board in one GP each. Ferrari especially has had difficulty in gaining points with both drivers and this is likely to cost them the constructors prize. There is no doubt that a win for BMW requires that the big two continue to stumble over their own feet in the remaining races. That is a pretty tall order but not beyond the bounds of possibility. There are still those who think that Hamilton could fade badly at the last, as he did in 2007, and Kovalainen continues to be variable in his performances. With Raikkonen going through his worst patch in years and Massa inconsistent, BMW have an outside chance if they can extend their amazing reliability record. So there is reason behind BMW's policy of backing both drivers equally. That may change next year but will most likely depend on how the drivers fare in the early races. And there is no guarantee that it will be Kubica that emerges as their strongest challenger; there is life in the old dog, Nick, I suspect. Consider that he is only 8 points behind Robert in the driver's championship at present - and this after a very difficult season. If the 2009 car suits him better, he could repeat the results of 2007, when he put Robert firmly in his place. Whatever happens, it is good to reflect on the record that Nick established in Singapore: he is now the driver with the longest unbroken spell of GP finishes, his 25 beating Michael Schumacher's best of 24. With consistency like that and a good car from BMW, he is bound to be a contender. It is definitely a good idea to keep both drivers. Next season we have a lot of technical changes to the cars and Nick is as good a development as there is. The other thing worth remembering is that although Robert has been the quicker driver this season it may be that next season's cars suit Nick better. As the monkey said, it remains to be seen. And perhaps that is precisely why BMW are happy with two drivers of such differing styles - with the cars changing so much next year, it might be as well to have your eggs in two baskets, rather than one. You could be wrong about slicks favoring the rougher drivers, Architrion. In the days when slicks were the norm, it was generally the smoother drivers who had the upper hand, with guys like Prost and Senna getting the better of Rosberg and Alesi. Don't count those chickens! It makes sense to stick with drivers as the team are doing so well, and perhaps it would be fitting if they win the constructers title this year after all the Ferrari/Mclaren sculduggery of late. I was reading in F1 Race Technology 2008/2009 Magazine (normally costs £20/$50 but found it in a second hand shop for 50p/$1 . The F1 Gods were smiling on me that day!) that a prominent unnamed F1 Technical Director says the 09 rules wont lead to a signifacant loss in cornering speed, and if slicks are used lap times might actually fall, if so slicks might not be introduced after all. But then again, it could be the 09 mind games have begun already!. I find it very hard to predict who will be the fastest next year as tires are only one of many changes. Most retired racers would say if you take the driver aids and 'aero' grip away, the true drivers will surface. Over here in the States, Mario always says give the cars way too much power and take away half of their grip and real racing will come back done by real racers. Let's hope so, I think F1 needs it right now. As usual Mario is right but it ain't rocket science. If you want cars that are good to watch and that need to be driven well you need a lot more power than grip and a lot more mechanical grip than aero grip. It is basic physics. The trouble is for a couple of decades the have had a lot more grip than power and the grip has been more aero than mechanical. The result cars that are boring to watch and can't overtake each other. If only Mario had been in charge for the past 20 years. well, this is great news. i'm glad i waited until today to read it. i was really disappointed this year because i hoped i'd see these two duke it out with each other. maybe next year i'll get my wish. although apparently i'll be at a motogp race at laguna, not a f1 race in montreal.